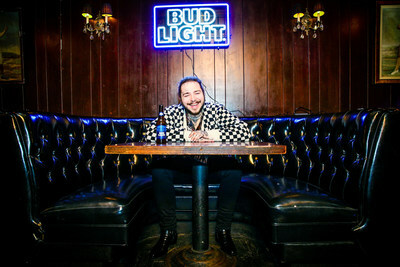 NEW YORK, March 22, 2018 /PRNewswire/ -- Today, Bud Light announced history-making, chart topping recording artist, Post Malone, as the next artist joining the brand's popular Dive Bar Tour this spring. Prior to releasing his next solo studio album and performing for sold-out festival crowds later this summer, Post Malone will take the Bud Light Dive Bar stage to perform for an intimate crowd in Nashville on Wednesday, April 4. Following-up on crowd-pleasing Dive Bar Tour performances in years past, which have featured Lady Gaga, John Mayer and G-Eazy, America's favorite light lager is continuing the popular series in 2018 with artists that they consider friends and fans of Bud Light. "It feels super cool to be the next artist to perform on the Bud Light Dive Bar Tour. If you know me, you know I love my Bud Light," said Post Malone. "I can't wait to get weird with ya'll in Nashville." The Bud Light Dive Bar Tour is an extension of the brand's friendship platform that celebrates the value of building friendships over music and beers. This year, The Bud Light Dive Bar Tour will share some surprises in advance of each show to get music fans even closer to their favorite artists. As in previous Dive Bar Tour shows, Post Malone could also be joined by some surprise musical friends during his performance. Post Malone recently released his latest single, "Psycho" featuring Ty Dolla $ign which debuted at No. 2 on Billboard's Hot 100 chart becoming just the eighth artist to debut multiple songs at No. 1 or 2 on the chart. Meanwhile, his RIAA 5x Platinum hit, "Rockstar" featuring 21 Savage went No. 1 for eight consecutive weeks and RIAA 7x Platinum smash "Congratulations" peaked at number 8 last year. Post Malone is scheduled to drop his second full-length album later this year. "Post Malone has been a long-time friend and supporter of Bud Light, so when we were thinking of artists to collaborate with in 2018, it was a no brainer to look into working with Post," said Andy Goeler, vice president, Bud Light. "We worked with Post Malone and his team on a program titled 'One Night Only' last year and we were thrilled with the fan response and we love that he always has a Bud Light in-hand while performing. We can't wait to see what he brings to his Dive Bar Tour performance in Nashville next month." 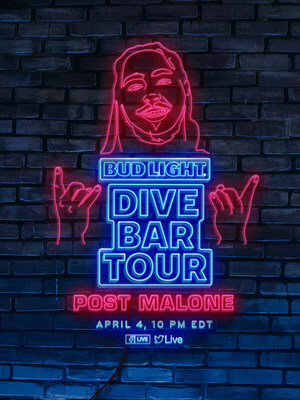 Post Malone's Bud Light Dive Bar Tour stop will take place in Nashville on Wednesday, April 4 and will be live-streamed on the Bud Light Facebook and Twitter pages for consumers to experience the show live from anywhere in the country. More details on the location and time of the performances will be announced on Bud Light's social channels in the coming weeks. For more information on the Bud Light Dive Bar Tour, please contact media@anheuser-busch.com. Join the conversation at #DiveBarTour and follow @BudLight on Twitter, Instagram and Facebook. Post Malone, the multiplatinum-certified Dallas, TX artist, continues to make history leading up to Bud Light Dive Bar performance this spring. Most recently, the single "Psycho" [feat. Ty Dolla $ign] bowed at #2 on the Billboard Hot 100, making him "the eighth artist to debut more than one song in the top two positions of the respective chart." 2017's "rockstar" ft. 21 Savage also shattered Apple Music's one-week record total for a single song with 25 million streams worldwide upon release. From there, the RIAA double-certified Platinum song soared to #1 on Billboard's Hot 100 chart and held the top spot for eight consecutive weeks, while also crushing the record for "Longest #1 Run on the Spotify Global Chart" for 114 days. Post stirs a mix of genres into his own sonic sound that's both intoxicating and invigorating on the RIAA double-platinum certified full-length debut album, Stoney. His uncanny ability to cook up a 21st century "sauce" of genres transformed the multiplatinum Dallas, TX maverick into the "#1 Debut Hip-Hop Artist of 2016." Upon release, Stoney bowed at #1 on the iTunes Overall Top Albums Chart and Top 10 on the Billboard Top 200. In just a few months, the debut album has accumulated over 4 billion streams globally. Setting the pace for alternative 21st century Hip-Hop, Stoney's unbeatable and unbreakable streak of smashes includes the breakout "White Iverson" (5x-platinum), his first Hot 100 Top 10 entry "Congratulations" [feat. Quavo] (6x-platinum), "Go Flex" (2x-platinum), "Too Young" (Platinum), "I Fall Apart" (Platinum), and "Déjà vu" [feat. Justin Bieber] (Platinum). Moreover, the superstar completed the "longest climb ever to #1 on the Top R&B/Hip-Hop Albums Chart" in history, breaking the previous record set in 1989, and topping the chart in its 51st week of release being named "the #3 Overall Streaming Album of 2017."